NEW YORK—An unusual work by jazz great Artie Shaw received its first New York performance in 77 years. Part of a showcase for first prize winners of the New York Concerti Sinfonietta International Concerto Competition, the concert was notable for the diversity of the instruments played and the relative unfamiliarity of the pieces themselves. Held on Nov. 13 in Carnegie Hall’s Weill Recital Hall, the concert highlighted seven different solo instruments, including a virtuoso violist. Five of the works performed were refreshing novelties, well off the beaten path. One characteristic the competition winners all had in common, however, was the stellar level of their playing. Twenty members of the top-flight New York Concerti Sinfonietta were on hand, expertly led by principal conductor Paul Hostetter. Violinist Emily Bruskin of the celebrated Claremont Trio served as the orchestra’s concertmaster. The artistic director of the New York Concerti Sinfonietta is Dr. Julie Jordan, a member of The Juilliard School Evening Division piano faculty. The concert was prefaced by a performance by guest soloists Opus Two, a violin-piano duo formed some 20 years ago by William Terwilliger, professor of violin and chamber music at the University of South Carolina, and Andrew Cooperstock, professor of piano at the University of Colorado at Boulder. This evening, they played Haydn’s Double Concerto in F Major for Violin, Piano, and String Orchestra, H. 18, No. 6. Concertos for this combination of instruments are quite rare; Haydn’s is the first. There are others by Hummel and Mendelssohn, and Mozart began one but abandoned it before completing the first movement. Haydn’s Concerto, an early work, is lightweight but pleasant listening, and Opus Two made the best possible case for it. The interplay of thematic material between the soloists was handled with sensitivity worthy of chamber music, while the 13 string players of the Sinfonietta provided an alert and tonally radiant accompaniment. Terwilliger’s playing was tasteful, while Cooperstock exhibited his experience in the way he shaped and contoured his phrasing, varied his dynamics, and clearly articulated the staccato figurations and trills. He displayed a full, rich tone distinctive for its warm bass. Cooperstock is also a master teacher: Several of his students have been winners of the International Concerto Competition in recent years. No fewer than six winners of the New York Concerti Sinfonietta 2012 International Concerto Competition, playing five different instruments, then treated the audience to solo performances. Leading off was an instrument that seldom secures a solo spotlight: the double bass. Colombian-born Angela Contreras, currently in the second year of a master’s program at Juilliard, studies with Eugene Levinson, legendary former principal double bassist of the New York Philharmonic. Contreras performed the Elegy No. 1 for Double Bass and String Orchestra by the 19th century Italian double bass virtuoso Giovanni Bottesini (he composed three, but the first is the best-known). Contreras played with the facility and expressivity one would expect from a cello but is rarely encountered from its larger relative. She gave a nicely nuanced, tonally attractive performance that was beautifully shaded and secure in intonation, from its solid lowest notes to the highest harmonics. Her great musicality made a strong impression. She was followed by Jessica Han, soloist in three movements from J. S. Bach’s Orchestral Suite No. 2 in B Minor for Flute and Strings, BWV 1067. Han, who holds Bachelor of Music and Master of Music degrees from Juilliard, studied with New York Philharmonic principal flute Robert Langevin and has played with the New York Philharmonic and the Mariinsky Orchestra. Han utilized a golden flute, notable for its warm, glowing tone. She gave an altogether superior performance, enabled by her extraordinary breath control and finger dexterity. This was Bach with gravitas, never rushed or trivialized. The opening “Ouverture” was unhurried and gracious. The second movement “Rondeau” was so graceful and dance-like one could visualize elegantly costumed dancers at a baroque royal court. The quick, concluding “Badinerie” was a particular delight. It was lively but not breathlessly fast, with playful, ascending scale embellishments. Han wisely placed emphasis on the spirit of the music rather than the velocity of the playing. The final work on the first half of the concert was the opening movement of the Haydn Cello Concerto in C Major, H. 7b, No. 1, performed by 21-year-old Japanese soloist Eru Matsumoto. She began studying at Juilliard at age 16 with the late cellist David Soyer of the Guarneri Quartet and is currently a pupil of Bonnie Hampton and Timothy Eddy. Matsumoto’s stylish playing displayed passion and expression, with just the right blend of assertiveness and suavity, never departing from a near-ideal classical repose. Her playing manifested beautifully controlled, off-the-string spiccato bowing, flawless intonation, and an ability to navigate the fingerboard with accuracy and agility. Maestro Paul Hostetter and the Sinfonietta both supported her concept. Eclipsed by Haydn’s Cello Concerto in D Major, the C Major Concerto had been in hiding for 200 years until it was rediscovered in Prague in 1961. It is one of Haydn’s more profound and inspired compositions. Matsumoto’s penetrating and cogent interpretation elevated the stature of the work: It was one of the finest performances of this concerto it has been my privilege to hear. After intermission, the hallowed environs of Carnegie Hall were pleasingly serenaded by jazz in the form of Artie Shaw’s Interlude in B-flat for Clarinet, Strings, and Drums, virtually unheard since its premiere at New York’s Imperial Theatre in 1936. Actually, there is abundant precedent for jazz at Carnegie. The main auditorium was the site of a pathbreaking Carnegie Hall concert by the Benny Goodman band in 1938. Many have followed since, including Miles Davis in 1961. Anderson finished off with a commanding, rapid flourish. Compared with an archival recording of Artie Shaw playing the Interlude himself, Anderson’s approach was somewhat “straighter,” but his mastery of his instrument was unsurpassed. Anderson, co-winner (with his twin brother, saxophonist Pete Anderson) in the jazz category of the International Concerto Competition, is a true clarinet virtuoso with technique to burn. The Anderson Twins will perform at the next concert of the New York Concerti Sinfonietta on Dec. 11. Next, we were presented with another novelty, the first movement of Alessandro Rolla’s Viola Concerto in E-flat Major, BI. 545, played by Liyuan Liu of China, who is completing her master’s studies at Juilliard with Heidi Castleman and Steve Tenenbom. Likely dating from the 1790s, the Rolla Concerto is an attractive, Mozart-sounding work. Liu’s performance reflected profound musicality and interpretative insight. The viola is infrequently heard in a solo capacity, and compared to a violin, it is difficult to play in tune due to its longer fingerboard, while the bow requires greater pressure to generate a solid tone. Yet there was no cause for worry on either score: Liyuan Liu was in total command of her instrument. Liu is an exceptional violist; her sound was seamless and velvety. In addition to her beautiful tone, she exhibited enviable facility and dead-on intonation. An additional eight 2012 Shining Stars Debut soloists performed without orchestra. They ranged in age from 10-year-old violinist Enrique Rodrigues to a 2012 masters’ graduate of Mannes College, pianist Tomoe Sato. Standouts among them were pianists Luke Zhuang and Audrey Luo. Zhuang gave a powerfully sonorous, dynamic, and exciting performance of the Scherzo, Op. 6, No. 3, by American impressionist composer Charles Tomlinson Griffes.Audrey Luo performed contemporary Russian composer Rodion Shchedrin’s highly rhythmic Basso Ostinato from Two Polyphonic Pieces, which she played with swagger and virtuosic flair.Cellist Benjamin Kim, heard earlier in the Saint-Saens Concerto, returned to dazzlingly dispatch the lilting Tarantella by William Henry Squire. Pianists Hannah Long, Madeline Wong, and Jonathan Wong also played, respectively, works by Chopin, Ravel, and the technically demanding Liszt Transcendental Etude No. 10. At a previous recital, I heard Ms. Liu zip through a viola transcription of an unaccompanied Paganini Caprice on her unwieldy instrument with a velocity and accuracy that would be the despair of most violinists. She is a major talent. The last competition winner to be heard was Korean-born cellist Benjamin Kim, in the Saint-Saëns Cello Concerto No. 1 in A Minor, Op. 33. Disregarding the “non troppo” admonition of the opening movement’s “Allegro non troppo” tempo designation, Kim gave us a daringly rapid, refreshing romp, its irresistible momentum carrying all before it. Kim reveled in the songful melodies of the second movement, employing a very personal and rhapsodic approach, while revealing an uncommonly rich and resonant tone. The exultant finale was abridged for reasons of length. However, the abrupt jump from the soft ending of the slow movement to the middle of a loud passage was a misjudgment, sounding like a defective, skipping CD. Surely, a better transition point could have been found. Following the International Concerto Competition winners, still to come were the 2012 Shining Stars Debut soloists, playing works not requiring orchestral accompaniment. The concert was memorable for the impressive and uniformly high quality of its International Concerto Competition winners, all of whom seem poised to fulfill promising professional careers. Michael Sherwin, a Fromm Foundation Fellow in music criticism, currently writes for The Epoch Times and Wagner Notes. Future concerts of New York Concerti Sinfonietta International Concerto Competition winners will be held on Dec. 11, at St. Joseph’s Yorkville (East 87th Street), Feb. 25 in Carnegie Hall, and Feb. 26 and May 5 at the Church of St. Joseph in Greenwich Village. The competitions, as well as debut performances in the “Shining Stars Series,” are open to musicians of all ages in various categories, including solo, chamber music, vocal, and concerto repertoire, as well as composers. 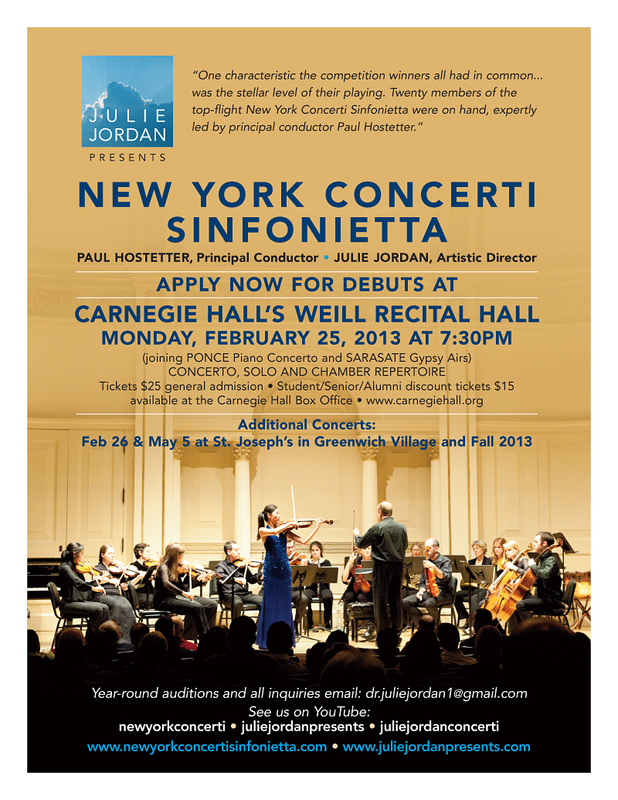 For information, contact www.newyorkconcertisinfonietta.com and www.juliejordanpresents.com.